A Christmas gift emergency from KidKraft! It’s a nature thing, not a nurture thing – little boys tend to like cars, emergency vehicles and all the things that go with them. Neither my husband nor I are particularly interested in cars but when we had our first boy it was obvious from the outset that he was. Many happy hours were spent playing with his toy garage, driving cars up and down the ramp, through the car wash and filling up with petrol at the tiny petrol pump. After watching my three boys all play with cars over the years, I have become an expert at spotting a good car-related toy and the KidKraft Deluxe Multi Storey Car Park and Fire Station are packed with pleasing features. The Deluxe Multi Storey Car Park includes the all-important ramps plus a petrol station, car wash, ticket booth and helipad. 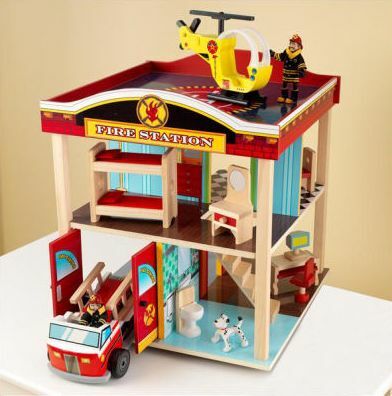 The superb Fire Station has opening garage doors, a fire truck and a helicopter, firemen and furniture to complete the firehouse. Both play sets are brightly painted with beautiful details, right down to the floorboards and ’tiled’ floors at the Fire Station (which will please parents’ eyes) but kids will be obsessed with that double-storey ramp, car lift and bursting the fire engine through the garage door. We have reviewed KidKraft previously on Babyology however until now, the Fire Station was not available in Australia. Lots of readers will be pleased to know that Wayfair now stocks the Car Park for $179 and the Fire Station for $149.